The first Bond film featured the nefarious, ever elegant Dr. No, the “SPECTRE” agent played by Julius Wiseman who dies sinking into the bubbling vat of a nuclear reactor. Dr. No and the reactor find a suitably elegant tribute in the form of this distinctive Skin Chrono: its textured white and pale beige synthetic fabric strap evokes Dr. No’s high-collared suit, and the dial recalls the reactor’s instrument panel. 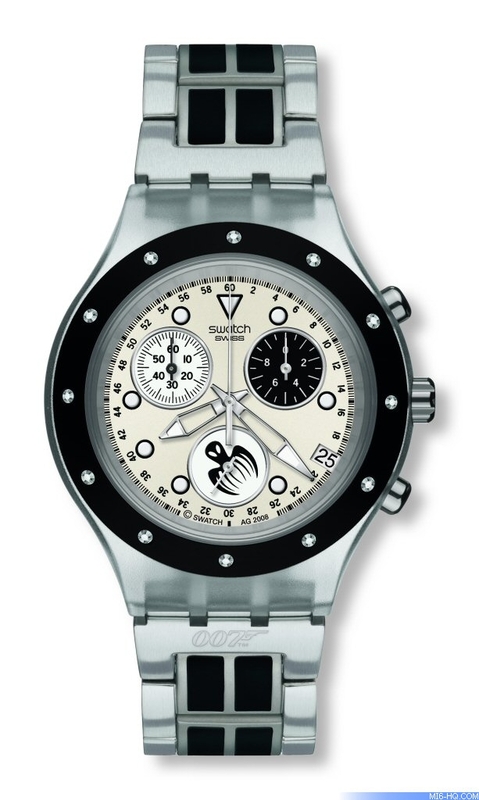 The milky plastic case has a black plastic crown and pushers and frames the sunbrushed light beige dial. The applique silver “instrument panel” is framed by a broad black ring with red hour markers and white minute indices and holds the silver legend “DANGER LEVEL” embossed against a black ground. Applique silver Arabic numerals indicate hours 4 and 8 and a delta sign is positioned to mark hour 12. Set within the black band are the two chrono counters, each with black numerals and black hands set off by a white dial, and the continuous seconds counter at 6 o’clock. The latter has a white dial with a red dot at the centre, black Arabic numerals and a black hand, and carries the label “HIGH VOLTAGE” printed above it on the lightly patterned pale beige central zone. Squelette metal hour and minute hands mark the time. Russia’s Rosa Klebb wields a nasty weapon in From Russia With Love, and this stylish Lady’s satin-brushed stainless steel bracelet features subtly sinister end pieces shaped like Klebb’s knuckle-duster. The bracelet leads to a satin-brushed stainless steel case and unmarked bezel framing a sunbrushed silver dial with applied silver Arabic numerals at all hours. Reflective metal hour and minute hands and a delicate silver seconds hand mark the time. A brilliant tribute to Oddjob, bowler-hatted henchman to the Midas of malice featured in the memorable Goldfinger, released in 1964. 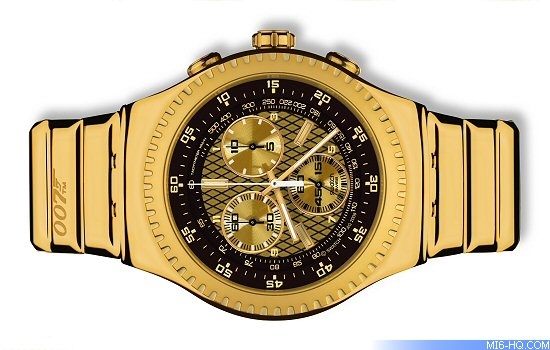 The heavy gold-coated stainless steel bracelet of this stunning Irony THE Chrono features a lightly engraved 007 logo on one of the links that evoke gold ingots leading to the massive, golden, stainless steel case. Mounted on the case is a golden bezel with engraved minute ring. The brown and gold diamond-patterned dial is circumscribed by a brown flange with a golden minute ring and golden Arabic numerals (05, 10, 15 ... 60) at all hours. 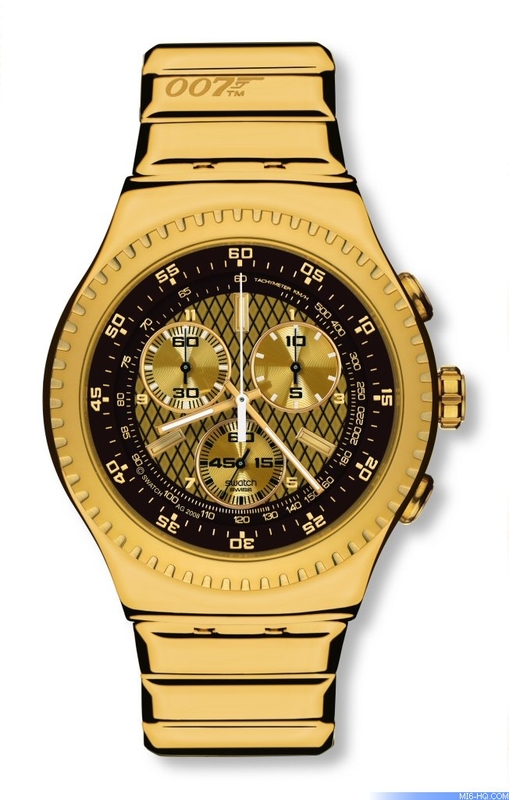 Flush with the flange is a flat outer ring with engraved gold-on-black tachymeter scale. Embossed gold ingot-shaped markers indicating hours 4, 8 and 12 are complemented by applied golden Arabic numerals at hours 1, 3, 5, 7, 9 and 11. The grooved golden chrono and continuous seconds counters feature black Arabic numerals and black or white indices and black hands. Lustrous golden hour and minute hands with white superlite highlights and a slim white chrono seconds hand mark the time. Emilio Largo, a black-hearted villain in Thunderball, wears a ring with an evil-eyed black octopus, the emblem of Bond’s enemy. The stainless steel bracelet of this dashing Irony Chrono Diaphane features satin-brushed steel links and a central row of paired dark resin inlays set in steel. The 007 pistol logo appears on the brushed steel end piece on the six o’clock side of the bracelet, just below the frosted translucent plastic case. 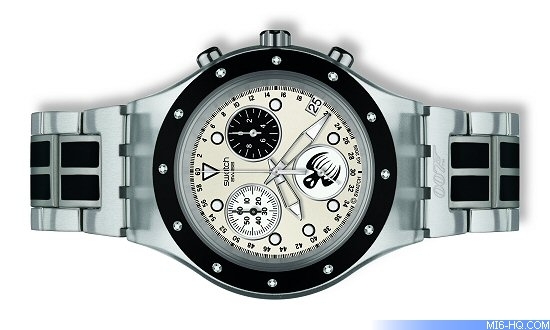 Mounted on the case is a matt black aluminum bezel with sparkling transparent white crystals set at all hours. The sunbrushed champagne dial shows a black minute ring with Arabic numerals (2, 4, 6 ... 18; 22 ... 60) and a black-on-white date window at 4 o’clock. Black-rimmed white superlite dots in relief mark hours 1, 3, 5, 7, 8, 9 and 11 and a black-rimmed white delta in relief appears at hour 12. The 60-minute counter features a white dial with black numerals and indices; the 1/10th second counter offers a contrasting black dial with white numerals and indices. 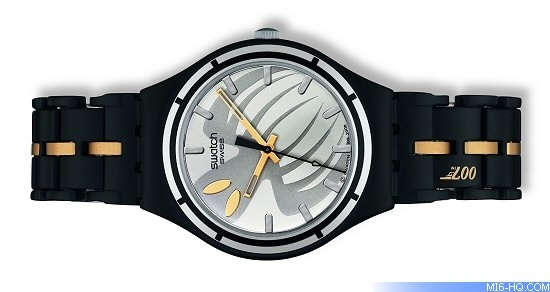 At 6 o’clock, the continuous seconds counter features Largo’s black octopus emblem on a pure white dial. Tie-shaped squelette metal hour and minute hands with superlite white highlights and a silver chrono seconds hand mark the time. Popular still among Bond film fans are Blofeld and his fluffy white cat, to which Swatch pays tribute with this classic Gent. The white synthetic leather strap evokes the cat and her master’s affiliation with the enemy organisation known as “SPECTRE”, represented by the ominous octopus with 8 spiky tentacles. This menacing beast appears engraved on a shining stainless steel charm dangling, like an ID tag on a collar, from the single stainless steel end piece that joins the six-o’clock side of the strap to the clear plastic case. The 007 pistol logo is displayed in silver on the white synthetic leather loop. The dial is a mirror marked at 1 o’clock by a light green cat’s paw print. All other hours are marked by printed white Arabic numerals. 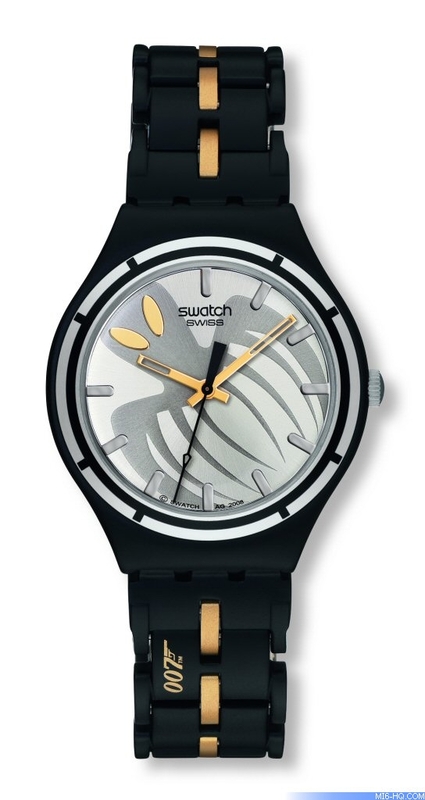 The hour, minute and slim central seconds hands that mark the time feature a sandpaper silver surface. On Her Majesty’s Secret Service features Telly Savalas in the role of Ernst Stavro Blofeld. One of Bond’s most formidable and long-lived antagonists, he is featured in three Bond films and is marked by the menacing sign of “SPECTRE”, an evil-looking octopus. The matt black aluminum bracelet of this elegant Irony Big features matt gold-coloured central links and gold 007 pistol logo printed on the first black link on the 6 o’clock side of the bracelet. Mounted on the matt black aluminum case is a silver and black bezel with black indices at hours 1,2 4, 5, 7, 8 10 and 11. Straddling the centre of the sunbrushed silver dial is Blofeld’s menacing silver octopus whose oval eyes are mirrored golden appliques. In the absence of all numerals, mirrored silver applique hour markers indicate all hours but 10 and 11, where they are replaced by the golden eyes. Mirrored golden squelette hour and minute hands and a thin black central seconds hand mark the time. In Diamonds Are Forever, black-hearted Blofeld henchmen Mr. Wint and Mr. Kidd attempt to assassinate James Bond with a bomb disguised as dessert. The alligator-pattern white leather strap has a black leather loop with a white 007 pistol logo and a stainless steel clasp; the strap forms an elegant counterpoint to the stainless steel bezel mounted on this classy Irony Medium’s polished stainless steel case. The bezel is set with 44 transparent white crystals that form a sparkling frame around the sunbrushed silver dial, which features a delicate white vortex pattern at its centre. Skeleton black Arabic numerals with white infills indicate hours 9, 10, 11 and 12; skeleton white Arabic numerals with black infills mark hours 4, 5, and 6; a black-on-white date window is positioned at 3 o’clock. A pair of transparent white crystals is set in the dial at hours 1 and 2; set directly opposite, at hours 7 and 8, are two more crystals, black. Slim oval squelette metal hour and minute hands and an elegant black central seconds hand with a white superlite highlight mark the time.